My fourteenth ground of 2016 was on Monday 29th August at the Leg O'Mutton Field in Cobham, Surrey. The match was Cobham vs. Dorking in the Combined Counties League Division One. 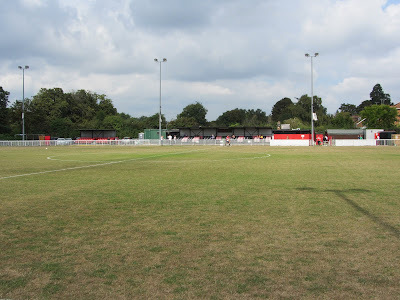 Leg O'Mutton Field can be found right on the western edge of the village of Cobham. This means it is mostly surrounded by green space (including nearby Painshill Park) with only the north side and part of the east side of the ground next to housing and allotments. The ground is 1.75 miles north of Cobham & Stoke d'Abernon railway station. There are two all-seater stands on the north side of the ground. The larger 86-seat structure straddles the half-way line and the club building housing a bar and dressing rooms is placed behind it. There is a newer 53 seat viewing area towards the western end of the ground which was installed in 2015. This additional seating will enable to club to host Isthmian League football should they encounter future success on the pitch. The southern side of the ground is more sparse with uncovered standing for the length of the pitch. There is a grass area behind this which then backs onto a wide area of green space outside the confines of the ground. The eastern end is hard standing but with a covered section directly behind goal - this isn't the pretiest site so has a temporary feel about it. The opposite end is similar in that it is uncovered standing except for a section behind the goal itself. At this end it is an iron stand with one level of raised concrete to act as a viewing platform. 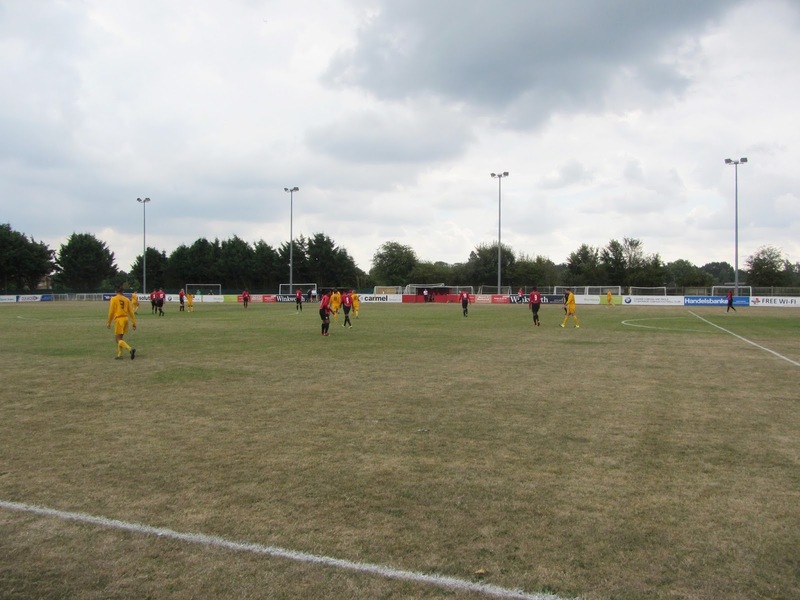 Cobham started the game well and after going close early on took the lead through Kieran Campbell in the 25th minute. A nice ball was played out to Campbell on the left-wing and he beat a defender before cutting inside and slotting past the keeper at the near post. This was a brief bit of interest in what was a poor first half - the two sides were fairly even but there was not a lot of quality on display. Already a goal down Dorking then lost their goalkeeper Tom Day when he broke his wrist during a collision in the 35th minute. The long stoppance for this meant a large amount of injury time at the end of the half and it was in the 5th minute of this where the hosts beat replacement keeper Luke Longhurst. 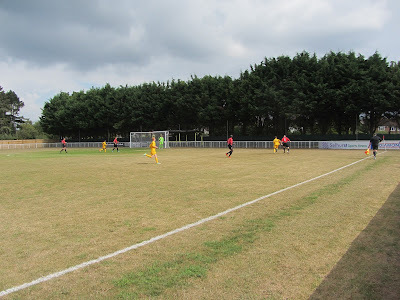 It came about when Cobham got the ball in box from the right and several players were queuing up to strike at goal - in end it was Jea Claude Yeboua who side footed it towards goal with the ball hitting the post, bouncing off the keeper's back and trickling over the line. The home side killed the game off just after the restart with the best move of the match - the left-winger held the ball on the edge of the box beforenbackheeling for Jea Claude Yeboua to ghost in and slam the ball into the roof of the net to notch up his second of the match. In the 56th minute Dorking came the closest they had been go a goal when Owen Hunte smashed the ball off the crossbar from 15 yards out. This spurred the visitors on and they were on top for the remainder of the game. This was even more evident when Cobham were reduced to ten men after Kieran Campbell received a second yellow for kicking the ball away. Shortly after this Dorking finally got their goal when the ball was played from the right into the six yard box and Brandon Watts poked home after scramble. Dorking peppered the home goal in the final minutes of the game but could not net again. Despite dominating the second half Dorking had left themselves too much to do and went down to a 3-1 defeat.